Why did you NOT post a picture of the drawings you referenced? That would have been helpful - and made what you are saying easier to understand. Thanks for your suggestion. I've added them to the post now. Hidden gems are great! Your top is so smart yet simple. My hidden gems are: Multi-panel dress Vogue 9022, Burda Style 6980 Culottes and The Abigail Dress by Amy Barickman. I love a good kimono tee pattern and this one does not disappoint! It looks terrific on you, Jane! Oh I forgot to say your top looks great! Having read your comments about this top, and the Sophia one I was considering, I may not bother with that and just stick with the New Look 6217 as my go-to woven tee! What a great too to have in your closet. It looks great on you! As a very new sewist with a similar body type to yours, I've found this post very inspirational. Thanks for the heads up about the pattern sales! I'm looking forward to trying this pattern set very much now. I hate to say it, but in my experience the Big 4 pattern is often so much better drafted than an equivalent indie pattern. They're usually cheaper, too, so I've all but given up buying indie patterns. I'd rather look for a Big 4 with a similar shape, and with line drawings so I can see exactly what I'm getting. Too many indie patterns don't have any technical drawings at all, so you've no idea whether the garment is going to work for you. This looks so lovely on you. I have the Sophia top and haven't got it to work yet, but haven't put that much effort in yet. 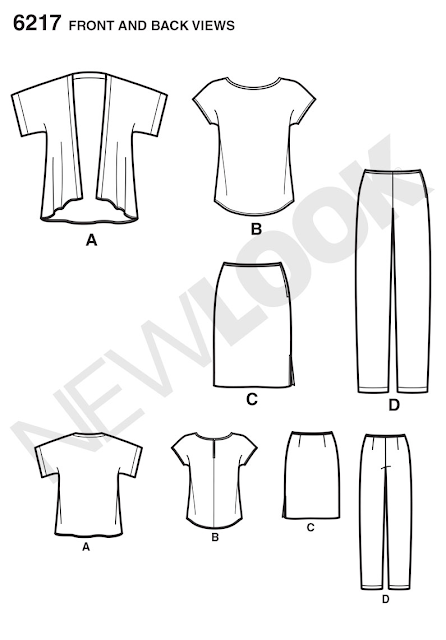 I have Butterick 5981 which looks a little boxier from the line drawings but I might try that and see. My hidden gem pattern is Butterick 5997 but you do need to make the front neckline opening much higher so you don't reveal too much. I've made this top up too and been impressed. The simple skirt with the side slit is just as great a design. I made them both up in the same fabric and worn together they look like a dress but are actually useful seperates. Just shared your vintage pledge on our Facebook sewing club page - scartho sewing club. Now I'm going to share this too!!! Love your newsletters and your blogs!! That really is a great pattern, and even better because I have it myself. I bought it for the kimono style jacket, which I made and was a bit meh about. I see now that the t-shirt is the gem of the collection. Sometimes the simplest pattern is the best, right? This really is a cute top. I like how your simple black version calls out the clean, easy lines. My new hidden gem is Butterick 5890. It looks super boring on the envelope front, but it made up into such a little top without much fuss or unnecessary detail. I really like the look of the top and I have just ordered the pattern. A very new sewer, so I hope it is as easy as it looks. Thank you so much for the tip. I think I may try that. I do like the drafting of New Look patterns. Nice one! My "hidden gem" isn't so hidden really as quite a few bloggers have used it with happy results. But just in case others have missed it, SIMPLICITY 1366 is a great little boxy crop top with dropped shoulder line & 3/4 sleeves. Nearly everyone (including me) adds an inch or 2 length as it's very short. Looks great sleeveless too! But be warned: the pattern features the world's ugliest skirt! Ugh! A hidden gem indeed. I probably wouldn't have been interested in that pattern based on the envelope front, but your black top is the perfect addition to any wardrobe! I'm sure you will get endless wear from the top - and endless options for using the pattern again. Thanks for sharing and for the inspiration! It really seems a basic to have in the closet, so I am going to give a look right now. And the quick sewing is a plus. The top looks perfect on you, chic and great to wear with a lot of bottoms! I love the top Jane, so much so that i have ordered it. Very simple but chic. I think you can make so many versions of this pattern that you could almost make a capsule wardrobe using just this pattern. 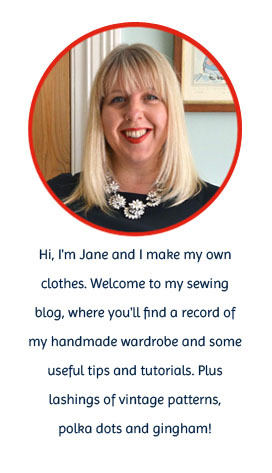 Your top looks great Jane. I have made both the top and the skirt up after getting the pattern free with a sewing magazine last year. Lovely pattern, I' going to use it again just now and maybe try both the kimono jacket and the pants. Perfect top on you! I love easy to wear items that don't look like a tent. I like the look of the kimono pattern too, I would love one in cream lace... but I'm not so confident sewing with lace!! This is a hidden gem! It looks great on you and you found the perfect fit. I am looking at this pattern for beginners...would the keyhole be necessary or could you pull it on without? oooh this is nice! I have just ordered a copy because I have the perfect fabric match - a length of really lush green sandwashed silk that I've been hoarding for a while... now I just need to work up the courage to tackle cutting/sewing silk! thanks for the inspiration! Ooh that is a great top and a great find! Sometimes simple is most striking and the Big Four do have some gems. Lovely! I like a lot that style of tops! The fabric is very pretty!